When one mentions Cavite, some people think of Tagaytay as if it is the only place in the province. On the other hand, some people believed that Tagaytay is a province of its own that is not within the boundaries of Cavite, given several places to visit in the city alone. Guess what? Cavite has numerous places of interest that are considered must-visits too. Here’s the list. Mt. 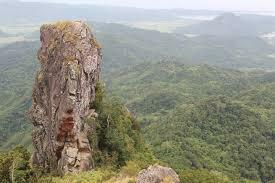 Pico De Loro, a part of Bataan Arc, is the highest point in Cavite. It is mostly known for its iconic rock peak dubbed as the “Parrot’s Beak” – a monolith – because of its shape. This is where it got its name. Seafarers used it as a signal wherein the east is where Manila Bay is located. Cabag Cave in Silangan is also known as Lucsuhin Cave. The main feature of the cave is the 50-meter long underground river. The mouth of the cave has a waterfall that forms a swimming pool-like basin. Crossing the Ylang-Ylang River, it is regarded as the first natural bridge in the Philippines. Located in Maragondon, the national park is a bird sanctuary. The 4,00-hectare is a protected landscape maintained and operated by the National Integrated Protected Areas System. Malibiclibic Falls is located near Mataas na Gulod. The falls is a place for drenching all the tiredness you feel while being in awe of the surrounding lush scenery. It is often described as breathtaking and spiritual. Going to the falls require a 30-minute trail that involves navigating through boulders. Balite Falls is a renowned falls in Amadeo because of its pristine was. It also has cold spring waters that makes it perfect for a quick weekend getaway. Balite Falls features a shallow pool that cascades into a bigger, deeper pool. These two waterfalls are central to the popularity of Balite Falls. Cavite is a historical province with several century-old sites. However, what makes Corregidor Island different is the presence of canons, forts, and ruins, bearing the scars of World War II. It houses the famous lighthouse that was built in 1853. Since this is a national monument, a guided tour of the place is required; it’s not open to the public. The Cove is overlooking the Ternate Coasts in all its breathtaking wonders. It can be considered as a hidden beach as very few people know the place. It is between more crowded resorts Caylabne Beach Resort and Boracay de Cavite. Kaynipa Cove is ideal for snorkeling. Carabao Island is also called Fort Frank, a defensive island during the American regime. The island is located at the mouth of Manila Bay. A forgotten fort, beneath the island are tunnels and chambers where American soldiers take refuge inside these. Built in the 1820s, this heritage house in Tanza is the oldest in the place. The youngest members of the Abad clan are maintaining the ancestral house. It is not open to the public, but you can always request for permission to explore the house that still bears its original structure and intricate designs. Mang Jose’s Rolling Kitchen is a hole-in-the-wall eatery, the usual stop after visiting Aguinaldo Shrine since it’s near. The kitchenette is popular for its puchon, lechon roasted in pugon. It used to be a food truck hence the name. Speaking of Aguinaldo Shrine, you won’t miss this famed restaurant because of its exterior – a replica of the shrine. Founded in 2002, its history can be traced back to 1974 since this resto in Trece Martires is a reincarnation of Town’s Delight. It is near the City Hall of Trece Martires. Amadeo is also known for its coffee, so it’s only right to find this unassuming coffee shop owned by a couple who were considered the first few coffee distributors in the province. Olivia’s Coffee also serves pastries to go with your espresso and brunch. De La Salle University’s Dasmariñas campus has a lifestyle museum inside. The museum includes 19th century themed rooms filled with antique furniture pieces and decorative objects to the delight of the probing guests. Kadiwa Park is Dasmariñas’s very own Dino World like the one you see in Pampanga region. The park is not that big, and so are the animal sculptures there. It has man-made waterfalls and benches where you sit and relax if you get tired of exploring the park. KidzWorld Resort is a place for people looking for edutainment – yes, kids and kids at heart. While it is membership-only, the club resort has almost a hundred creative and interactive games. It has five themed attractions, but Magellan’s PlayWorld remains to be the most exciting of all. It features seven sub-attractions such as interactive doll houses, opera house carousel, and Safari-inspired maze. The leisure park is very family-friendly. Bacoor Family Ecopark has a playground as well as a lagoon perfect for fishing and boat riding. Several nipa huts lined the edges for the visitors to relax and eat. There is also a multipurpose hall to hold events and occasions. Tagaytay will always be close to the hearts of the travelers. Nevertheless, there is more to Cavite than the places in Tagaytay. Above are these places that you may also try to visit especially when Tagaytay gets too crowded. What is the Role of AWS Solutions Architect?